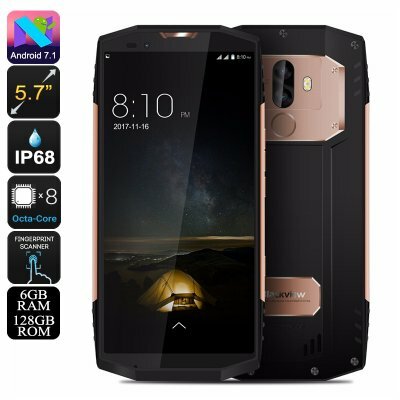 Successfully Added HK Warehouse Blackview BV9000 Pro Rugged Phone - 4180mAh, Octa-Core CPU, Android 7.1, 6GB RAM, IP68, 13MP Cam (Gold) to your Shopping Cart. With its Octa-Core processor at 2.6GHz and whopping 6GB RAM, the Blackview BV9000 Pro Android phone delivers a stunning performance. This latest Android phone lets you tackle the most demanding software features at ease. Whether you’re into games, movies, or Apps – this Android phone handles it all. Simply head out to the Play Store where you’ll be able to find the latest media for free. With 128GB internal storage, you will have plenty of storage available to fill up to stay entertained for years to come. To make sure you’ll never feel bored again, this rugged Android phone packs a whopping 4180mah battery. This cell gets you through multiple days of regular smartphone usage without needing to worry about running out of juice. This latest Android phone features a fully rugged body that has been rated IP68 waterproof. Therefore, this rugged smartphone is fully protected against water, dust, and drops. You’ll be able to use this beauty in the toughest of environments without needing to worry about its well-being. It furthermore comes with a stunning 5.7-Inch display that features Corning Gorilla Glass 5. This means that you don’t have to worry about your display scratching or breaking while using it in the outdoors. By supporting HD resolutions, this Android phone treats you to a cinematic experience no matter where you’re at. While enjoying the outdoors, this Android phone makes sure that you’ll always stay connected. This is achieved by treating you to Dual-IMEI numbers and 4G. The Blackview BV9000 Pro lets you access the internet no matter where you’re at. Additionally, it lets you stay reachable on two different phone numbers no matter where you’re located. This makes the phone great for separating work and private life. Besides treating you to ultimate connectivity, this rugged smartphone also lets you snap breathtaking pictures and video. This is made possible thanks to the phone’s 13MP Dual-Rear camera. If you’re a smartphone photography lover, this Android phone is perfect for you. The Blackview BV9000 Pro comes with a 12 months warranty, brought to you by the leader in electronic devices as well as wholesale rugged smartphones..